Gondolin - After the first failed attempt to recover the Silmarils, the Noldor settled into Beleriand. This led to the reunion of the Noldor with the Sindar. However Thingol was not overly enthusiastic about the reunion. And so the majority of the Noldor had to make homes for themselves; and two great cities were built, one modeled after Tirion, and the other after Menegroth (see Nargothrond below). 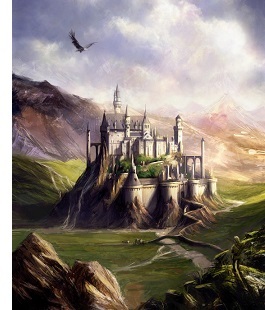 The one modeled after their home in Aman was named Gondolin. It was built by Turgon, son of Fingolfin. And Gondolin was surrounded by a circle of mountains making it highly defensible.